and improving their photography with Full Stop camera guides! 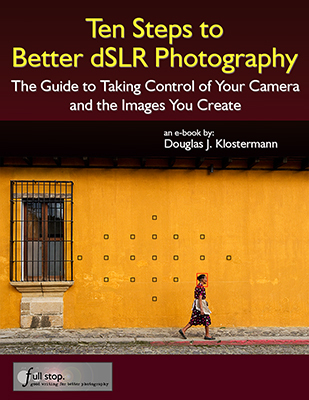 Ten Steps to Better dSLR Photography is an e-book guide to help digital SLR photographers take control of their camera and the images they create. Capturing great images with your dSLR should not be the occasional result of chance and luck. By taking control of your camera, its functions, and its settings you can begin to work with consistency and intention and take the photos you desire. Readers of Doug's popular dSLR camera guides such as Nikon D5100 Experience and Your World 60D have benefited from his clear and concise explanations of digital SLR photography functions and concepts. With Ten Steps to Better dSLR Photography all photographers including Sony, Pentax, and Olympus dSLR users can learn these essential elements necessary for taking full advantage of a dSLR including how, when and why to use the camera’s various functions and settings. Controlling Your Autofocus System - focus where you want for sharp photos of still and moving subjects. Understanding Apertures and using Aperture Priority Mode to capture dramatic depth of field. Understanding Shutter Speed and using Shutter Priority Mode to freeze or express action. Understanding Manual Mode and how to take full control of your exposure settings. Choosing the Metering Mode, Adjusting Exposure Compensation, and Using the Histogram for proper exposure in all lighting situations. Determining proper ISO Settings and White Balance Settings. Selecting JPEG or RAW image file format to save your images. The Image Taking Process - a tutorial making use of all the steps learned. This 54 page illustrated PDF guide can help the novice or intermediate photographer better understand their camera and how to take full advantage of its capabilities, to consistently capture better images, whether you shoot with a Canon, Nikon, Sony, Pentax, or Olympus dSLR camera. Please contact me to purchase the PDF, or click the links below to purchase other formats of the guide. -Your e-reader device, Nook, or Kindle (note: Contact me for a MOBI version if you cannot open the secured PDF file on your Kindle). -Android tablet - Galaxy, Xoom, Playbook, etc. (note: Contact me for an EPUB version if you cannot open the secured PDF file on your Playbook). The iPad and iBooks version is available through iTunes or through the iBooks App on your iPhone/iPad. 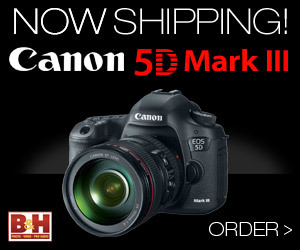 Take control of your dSLR camera and the images you create! This manual is a clearly written, concise and useful explanation of the rationale for the seemingly infinite and often confusing settings options. Used in conjunction with the (camera's) manual I feel a bit more confident in understanding how to at last proceed in getting better photographs. A comprehensive and concise guide for hobbyists who desire to enhance their photography experiences. I highly recommend this guide to anyone who wants to get out of auto mode and learn how to take high-quality photos. The instructions and explanations are easy to follow and well organized. The guide is a portable class on digital photography! A must-have if you want to learn how to use your camera to its fullest advantage. I don't know how I could fully take advantage of all the features my camera has to offer without this publication! It's well-organized, easy to understand, and succinct enough to keep your attention while still containing a wealth of information, tips and tricks to get the most out of your camera. I'm very happy that I found this guide. Doug Klostermann is a travel, culture, and humanitarian photographer dedicated to documenting the work of international aid organizations. He has photographed for numerous organizations in Latin America and the United States, been recognized by the United Nations Development Programme for his humanitarian photography, and been published in magazines and books including Conde Nast Traveler, Sherman's Travel, South American Explorer, and Viva Travel Guides. Doug is a member of the National Press Photographers Association. View his images at www.dojoklo.com. Learn more about photography equipment and techniques on his blog Picturing Change at http://blog.dojoklo.com/. with this e-book user's guide.